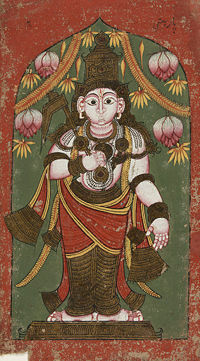 In Hinduism, Balarama (Devanagri: बलराम) is listed in the Bhagavata Purana as an avatar (incarnation) of the Hindu god Vishnu. He is known as the elder brother of Lord Krishna and worshipped by some devotees of Vaishnavism. Reverence of Balarama is especially popular in South India as well as in the Gaudiya Vaishnava tradition of ISKCON. Etymologically, Balarama derives from the Sanskrit words bala (meaning "strength") and Rama (a name of god). Accordingly, Balarama is considered to be extremely strong and, as such, he is also known by strength monikers such as Halayudha ("carrier of the plow"). Though overshadowed in worship by his brother Krishna, Balarama still plays a role in Hindu tales and remains a popular deity for some Hindus today. Balarama and Krishna are often considered to be a joint incarnation because they are both sons of Vishnu. Balarama himself is sometimes listed among the Dasavataras, the ten most prominent incarnations of Vishnu. Lists of these ten divine manifestations frequently differ with the most commonly accepted version as: 1) Matsya, (fish); 2) Kurma, (turtle); 3) Varaha, (boar); 4) Narasimha, a (man-lion); 5) Vamana, (dwarf); 6) Parasurama, (man wielding an axe); 7) Rama, (righteous man); 8) Krishna, (teacher of the Bhagavadgita); 9) Buddha, (enlightened one), and 10) Kalkin, (the final avatar who has yet to arrive). 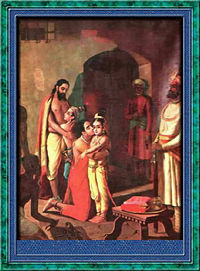 Some Hindu sects substitute Balarama for Rama as the seventh avatar. Beyond this list, Balarama is among the 25 avatars of Vishnu listed in the Bhagavata Purana, where he is considered to be the nineteenth incarnation. He is also identified as an incarnation of Shesha, the divine serpent upon whom Vishnu rests. Because Balarama, the son of Rohini, increases the transcendental bliss of others, His name is Rama, and because of His extraordinary strength, He is called Baladeva. Balarama was raised by Rohini, and he spent his childhood as a cowherd boy alongside his brother Krishna. The two children would partake in many adventures together as they grew, and even quarrelled with one another from time to time. Just like their contrasting skin colors, their personalities are defined by diametrical opposition: while Krishna's succeeds on account of his effeminate beauty, Balarama thrives by way of his sheer masculinity. Balarama and Krishna are the most human of the human incarnations of Vishnu; while figures such as Rama are notable for their perfected morality, the twin sons of Rohini exemplified numerous weaknesses. An example of this is Balarama's proclivity for imbibing in an excess of alchoholic beverages. In one instance, an intoxicated Balarama ordered that the River Yamuna, anthropomorphized as a goddess, come closer to him so that she would be more accessible when he wished to bathe. When the river did not comply with his request, Balarama used his plough to pull her until she surrendered to his will and moved closer to him. Despite his apparent abuse of intoxicants, it was Balarama who issued the prohibition of such substances within the holy city of Dvaraka. As an adult, Balarama married Revati, the daughter of King Raivata, ruler of the Anarta province. The king believed that his daughter was of such incomparable beauty that mortal men were not worthy of her hand in marriage. In an attempt to find Revati a husband, Raivata sought the advice of Lord Brahma, the creator god. Brahma suggested that Balarama was the most suitable suitor, although he took many thousands of years to reveal this information. When Raivata and his daughter finally did return to the physical realm, they found that humankind had grown much over the centuries in which they had been gone. Thus, when Revati was presented to Balarama, he promptly used his plough to wittle her down to an adequate size. Balarama was a weapon expert and is famous for his ability as an instructor of combat tactics. He taught both Duryodhana of the Kauravas and Bhima of the Pandavas the art of fighting with a mace. When war broke out between the corrupted Kauravas and the dharma-abiding Pandavas, Balarama considered himself equally affectionate toward both parties and so decided to side with neither group. Bhima, a warrior of greater strength, eventually defeated Duryodhana, a warrior of greater skill, by dealing him a blow below the navel with his mace. Upon hearing of this, Balarama threatened to kill Bhima, and was only prevented from doing so by Krishna. Balarama's death is described in the Bhagavata Purana. After taking part in the battle that caused the destruction of the remainder of the Yadu dynasty, Balarama witnessed the disappearance of Krishna from the earthly realm. Having seen this, he then sat down in a meditative state and produced a great white snake from his mouth, that is, the holy serpent Shesha of whom he is sometimes said to be an incarnation. Shesha then carried Balarama into the ocean and out of the physical world. In accordance with the legend of his origin, Balarama is commonly depicted as being a fair-skinned man, especially in comparison to his brother, Krishna, who is shown as dark blue or black in hue. Balarama is almost always shown with two arms, in which he holds his two weapons, the plough and the mace. He is usually heavily ornamented with earrings, bracelets and armlets. Traditionally, Balarama is dressed in blue garments and wears a garland of forest flowers around his neck and his hair is tied in a topknot. In the tradition of Gaudiya Vaishnavism, a lineage which originated from the teachings of sixteenth century Bengali revivalist Caitanya Mahaprabhu, Balarama is held to be as equal in supremacy to Lord Krishna. While Krishna is considered the Creator of the universe, Balarama represents his creative potency; of the three transcendental elements (sat, cit and ananda), Balarama is in charge of sat, which refers to eternity or truth. Hence, he is worshiped in this tradition as a supreme teacher or adiguru. 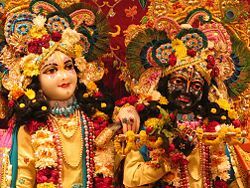 For the International Society for Krishna Consciousness (ISKCON), a modern continuation of the Gaudiya lineage, Balarama is a particularly important character. Balarama's significance also streches as far as the Jain tradition, where he appears alongside his brother in a number of important mythological texts such as the Hiravamsa Purana. Despite the recognition of their mutual godhood, Balarama's popularity has never equalled that of Krishna. Balarama is constantly serving his brother in every respect in each of his incarnations and manifestations. For example, in the Ramayana, which tells the story of Lord Rama, Balarama is said to serve the titular character as his younger brother, Lakshmana. In the Kali-yuga, the current age in the cyclical cosmology of Hinduism, Balarama appears as Nityananda, the close friend of Caitanya Mahaprabhu who helped spread the Sankirtan movement. ↑ Bhagavata Purana, 1.3.23. "In the nineteenth and twentieth incarnations, the Lord advented Himself as Lord Balarama and Lord Krishna"
↑ Balarama has also been called Sankarsana, which describes his transfer from one womb to another. This page was last modified on 9 May 2016, at 18:38.